Okay here it is my DIY table tutorial. If you have any questions please leave a comment and I will get to you asap. If you build this table please send me pictures I would LOVE to see what you build. I layed it all out and ended up cutting off the legs they were too long so i cut them down to 32 inches(as listed) You can tweek your table to any measurement you would like. I used glue and screws to put this together it will be more secure if you use both. You don't need a ton of glue just a bead down each board, screw it together and let dry. Here is a good pic of the whole table and what it should look like during the process. This is so you can see the top slats, I used 2.5 inch nails to screw into the base. I am not sure how much this table would have cost because I already had the wood, but it would be easy to price out at Lowe's or Home Depot. Just take the cut list and go to the store and see how many of each board you need (just pick out the straightest ones)They will also cut the wood for you to the lengths needed. I have had better luck at Lowe's they never charge me unless I have a ton of wood to cut. If I had to guess I would say this would cost under $100. Don't be timid when applying this gel, I just dump a blop on the table and start spreading until in is the color I want. Good luck everyone!! Happy building. This is just so beautiful, I love the color and style, and the decor is beautiful too! Lyndsey- Thanks you are right I did leave those two pieces out thanks for letting me know. OK, I have a like 100 projects on the go, but I really like this, and I think I could make it. I can put all sorts of things with yarn or fabric together, but when it comes to wood, I get timid. I need to get over that, especially since I could probably make this with what's in the garage. I'm bookmarking this blog!!!! 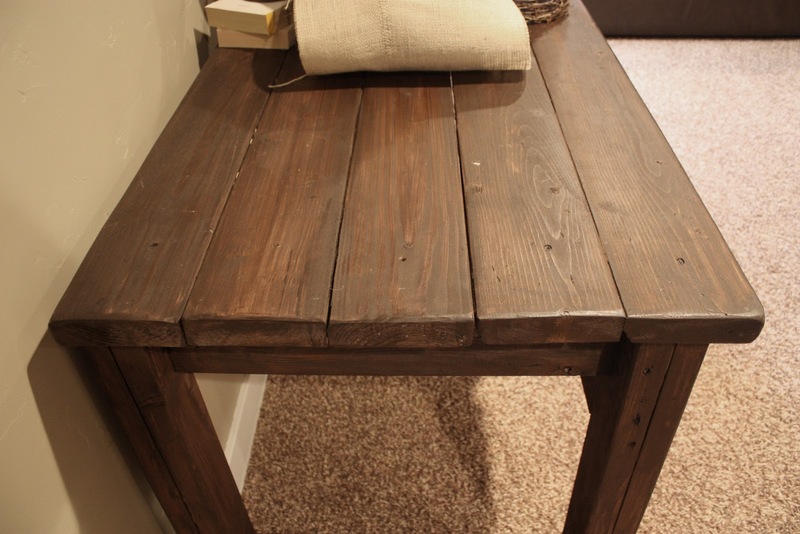 Love the table's chunky, rustic charm and the overall, finished ensemble with decor is perfect! I'm adding this to my want to make list. Love the rustic old wood look. I am curious though if you would share where you found the rod mounted above the table holding your pictures. I absolutely love it. Love this! Newest follower from house of grace! OMG I just love this! So gonna have to build one or two of these for our new apartment :) We just moved and your blog is really really helping me make it homey and nice :) Thank you so much Lindsay! I got the rod at Rod Works. They have an online store now!!! I love this table. I'm searching for something just like this. I'm not handy...so I'm hoping my husband can make it for me. Glad I found your blog! Love your work. Did you also make the frame holder hanging above the table? If so, can you please share how you did it!? I purchased the rod from Rod Works in Utah. But....... they now have an online store!!! go check it out you will be SO glad you did. Hi!!! love this! Did you add boards to the bottom of this table? I think in a more recent photo you added a bottom for shelving? thanks!